James Luther Margason was born July 21, 1937 to Luther and Ann (Schide) Margason in Kellogg, Idaho. He grew up there and attended school in Kellogg. Jim worked various jobs in his lifetime. His first job was with the Kellogg Fire Department, then Bunker Hill silver mining operation, then to the forest service with the Kingston Ranger Station. He worked for the City of Kellogg in the Street department for 16 years and later returned back to Bunker Hill. After Bunker Hill shut down in 1981, he went to work for CDA Unitech. Later he worked for A & R Construction building bridges and finally to Dave Smith Motors of Kellogg until he retired. Jim was united in marriage to Jean (Lewis) Margason on September 31, 1976 in Coeur d'Alene. Their union was blessed with one daughter, Brenda and 31 years marriage together. Jean died on November 16, 2007. 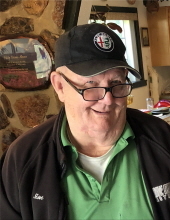 On April 1, 2019, James Luther Margason died at his home in Coeur d'Alene at the age of 81 years. Jim was a member of St. Rita's Catholic Church in Kellogg, Idaho. He belonged to the Knights of Columbus in Kellogg and the Kellogg Elks. He enjoyed driving to Kellogg, Idaho visiting family and friends. Jim is lovingly remembered by his brothers, Richard Margason both of Kellogg, Idaho; sister, Joanne Dolth of Post Falls, Idaho; grandchildren, Oreanna (Delbridge) Yates, Brandon McNearney, Brian Etherton, and Michael Etherton; stepdaughters, Jeanae (and Tim) Etherton of Pinehurst, Idaho, and Shannon Wood of Elko, Nevada; and a niece, Pam Jones of Kingston, Idaho. He was preceded in death by his wife Jean Margason; daughter, Brenda Delbridge; grandsons, Anthony James Delbridge and Joseph Nathaniel Delbridge; sister, Violet Lyree; brother, George Margason; and sister-in-law, Sandy Margason. Blessed and eternal be the memory of James Luther Margason. To send flowers or a remembrance gift to the family of James Luther Margason, please visit our Tribute Store. "Email Address" would like to share the life celebration of James Luther Margason. Click on the "link" to go to share a favorite memory or leave a condolence message for the family.